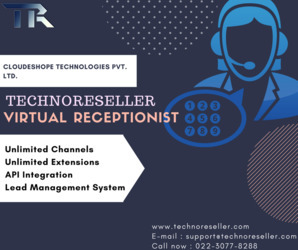 TechnoReseller is one of the leading cloud telephony service provider in India. Our aim is to provide cloud telephony network which is reachable to every business. We provide IVR, missed call services, bulk voice calls, toll free numbers and bulk SMS services. Our strength is the quality of services on which we never compromise. We work to deliver quality service at reasonable rates. We assist our customers reap the benefit of the newest enhancement in IT and telecom sectors.For us the most significant is that the customers begin using the newest technologies for sales and support purpose.